Originally released in Japan in November 1990, it would take almost 18 months before The Super Nintendo Entertainment System was finally available to purchase officially in the UK. Coming as it does from the early 1990s, PAL SNES owners often had to make do with with un-optimised games featuring letterboxed images and slower gameplay. If that wasn't enough, the lead time between games being released in the US and Japan before finally seeing the light of day in PAL regions could be years, and many titles failed to arrive at all. With the cartridges featuring region encoding the only way to play US or Japanese games on your PAL SNES was to purchase a convertor or open your machine, invalidate the warranty and make the necessary modifications. Most semi-serious PAL owners would buy the convertor to play import games with, but would still run their games at 50hz, meaning the games would run slower than originally intended. My current SNES is a PAL unit which has been expertly modified by those wonderful people over at Console Passion. 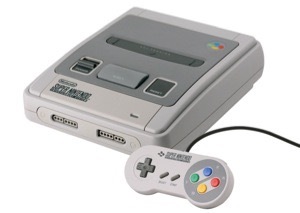 The cartridge slot has been widened to accept the chunky US cartridges, and the electronics have been modified so that a quick tap on the reset button causes the machine to rest as normal, but longer presses switch the SNES between US, PAL and Japanese regions. Also in my collection is a Multi Game Hunter device. Similar in function to the Everdrive, this is a floppy disk system that sits on top of the SNES and gives you the ability to load and save games to floppy disk. With the advent of the Everdrive this system is largely redundant and is kept as more of a curiosity item.